Today on Google you’ll see a Google Doodle that commemorates what would have been the 125th Birthday of Sir Frederick Banting, who discovered that diabetes could be treated with insulin, a discovery that has saved millions of lives. November 14th is also World Diabetes Day which is led by the International Diabetes Federation to bring about awareness for both type 1 and type 2 diabetes.Currently 415 Million adults worldwide are living with diabetes. 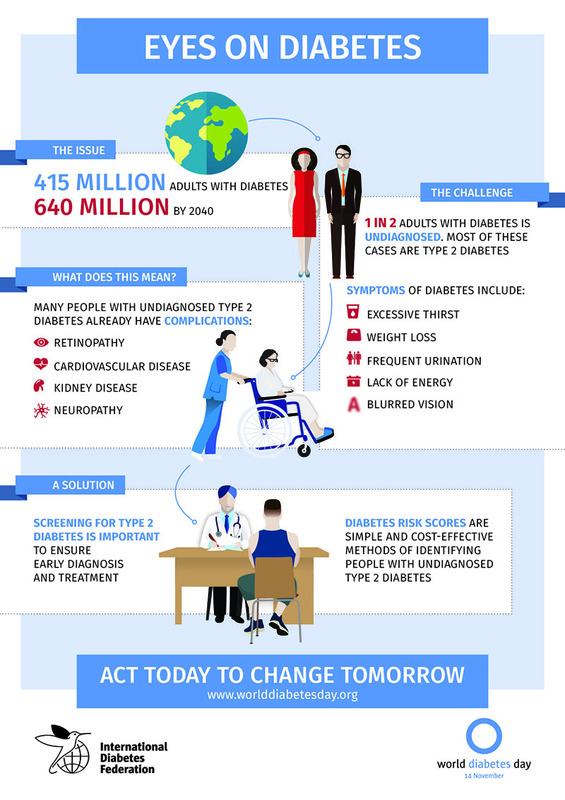 Yet as many as one in two people that are living with diabetes are currently undiagnosed. Often this is because diabetes has few noticeable symptoms. However, diabetes can have devastating effects on your overall health and is a risk factor for heart disease, kidney failure and it is also the leading cause of blindness worldwide. Vision loss associated with diabetes is often due to diabetic retinopathy, which causes damage to the blood vessels in the eye.Comprehensive eye exams with dilation have proven to help with early detection of the disease. A dilated eye exam gives eye doctors a better view of the blood vessels in the back of your eye to help identify both eye diseases and a variety of health conditions like high blood pressure, high cholesterol and diabetes. 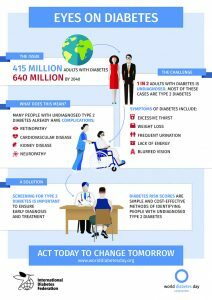 And good news – a healthy lifestyle can help you delay or even prevent the onset of type 2 diabetes.Learn more about diabetes in the infographic below or visit worlddiabetesday.org for more information.To schedule your next eye exam.